Radio listeners are soon to be offered a new type of radio which can play and record both digital and conventional radio. The new generation of such radio sets was demonstrated in Amsterdam at the IBC, International Broadcasting Convention, by the Digital Radio Mondiale, (DRM), consortium. They were first unveiled last week at a Berlin consumer electronics show. Peter Senger, DRM chairman and chief of Germany's international radio station Deutsche Welle, said that it is the first digital radio which can receive the main European radio systems: DAB, DRM, AM, FM/RDS and short wave. DRM is intended to replace long wave, medium wave and short wave broadcasts with a more reliable and higher-quality service for an audience which has largely moved to FM. AM is perceived as low quality because of interference and low fidelity. The sample radio sets are the product of collaboration between the DRM consortium, Texas Instruments and RadioScape. What started as discussions between international broadcasters is now almost ready for the general public. "We have been pregnant for seven years and have now given birth", said John Sykes, the BBC World Service's digital radio project director. Currently, 40 European broadcasters send more than 500 hours of programming daily using the system. The choice is limited but ever-increasing: Radio Luxembourg has just relaunched an English service using DRM. 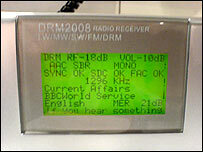 The BBC World Service also started a DRM radio service for Europe and even Deutsche Welle has committed to the phasing-out out of conventional short wave in favour of DRM. There are opportunities for more stations. World Radio Network, which packages radio programmes from abroad is to trial a London-wide DRM service and regional services for Europe beamed from Bulgaria. "London will provide a rigorous test environment," said its managing director, Gary Edgerton. "If it works in London it will work anywhere." He envisaged specialised niche services which present AM and FM do not provide. International commercial and public service broadcasters are frustrated that they cannot reach many listeners reliably across borders. DRM could help them. "This technology allows better radio, over greater distances, in better quality", said Anton Hierhager, business development manager digital radio for Texas Instruments. At the same time that popular commercial stations and respected public broadcasters are increasing the availability of DRM content. 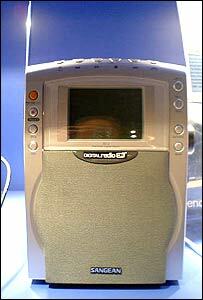 DRM-capable radios products are heading for the shops for Christmas 2005, DRM chief Peter Senger said. The radios will first be made by Morphy Richards, Roberts Radio and Sangean. There is no official price tag but it is thought that the early models will cost in the region of about 250 euros (£169). The designs are varied and not unlike DAB sets already on sale. IBC takes place in Amsterdam from 8 to 13 September.